April 8, 2018 Robert W.
Custom wood signs in Vegas are available through local sign companies for those clients that prefer wood signs versus the aluminum signs. Several years ago, the heavy wood signs were the main sign when making larger signs. That has changed now with technology and the ability to use aluminum substrates. However, there are some cases where custom wood signs have an advantage over aluminum. In windy areas, the heavier wood signs have an advantage over the lighter aluminum signs. The heaviness of the wood makes them more formidable against the high winds that Las Vegas experiences from time to time. Custom wood signs are made just like any other type of sign. 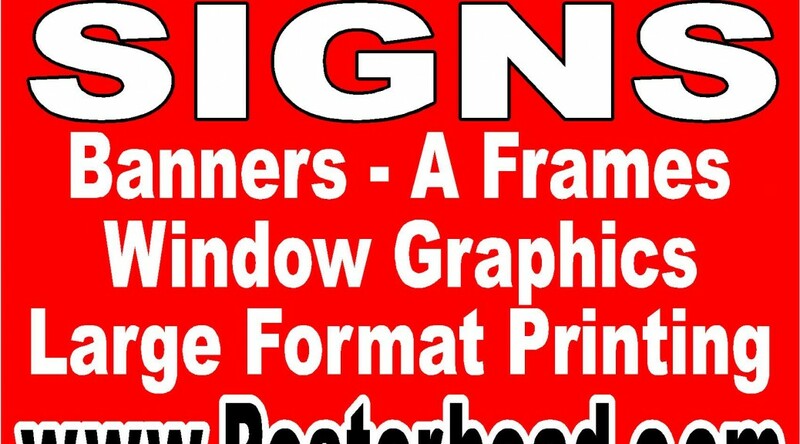 The graphic is printed on a large format printer with special inks designed to last in the outdoor weather of Las Vegas, laminated so that the signs ink will last longer and protect the vinyl print against weatherization, and then applied to the wood in the same manner as the aluminum sign. The cost difference between a wooden signs and an aluminum sign is about 25% because the MDO board sign is a more expensive substrate. These custom wood signs are used for selling vacant land and also placed in front of commercial buildings to let people driving by that the property is for rent or for sale. The larger the custom wood sign, the more information can be placed on the sign to describe the property and place contact information for that real estate company or individual representing the property. Custom wood signs are available at sign companies throughout the Las Vegas valley at very reasonable prices. The start to finish time to build a sign is about 3 to 4 days and many sign companies offer assistance in placing the sign at your location. Contact a sign company today to get started !